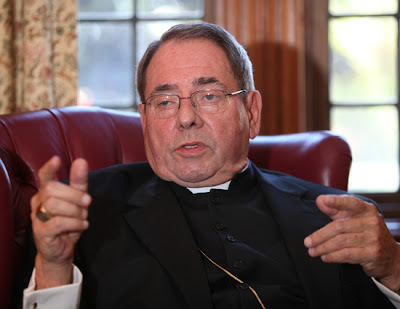 SUNLIT UPLANDS: New Jersey Legislators Demand Archbishop's Resignation; Call Myers' Behavior "Sickening"
New Jersey Legislators Demand Archbishop's Resignation; Call Myers' Behavior "Sickening"
"And see if there are any vacant basilicas in Rome where I can hideout like Cardinal Law"
Greeting the deepest crisis of his 12-year tenure with silence, Newark Archbishop John J. Myers faced new calls for his resignation yesterday from two New Jersey lawmakers, who blasted him for allowing a priest to minister to children despite a lifetime ban on such interaction. Sen. Joseph Vitale (D-Middlesex) and Assemblywoman Valerie Vainieri Huttle (D-Bergen) said the archbishop has displayed "arrogance" and a lack of common sense over his handling of the Rev. Michael Fugee, 52, who admitted fondling a 14-year-boy in 2001. 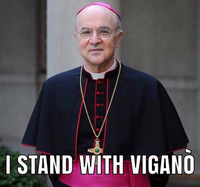 Under the terms of a binding agreement with authorities six years later, Fugee and the archdiocese vowed the priest would not work in any position involving children. Yet for the past several years, Fugee has attended youth retreats, heard confessions from minors in private rooms and traveled to Canada with children from a Monmouth County parish, The Star-Ledger reported earlier this week. "Enough is enough," said Vitale, who has pushed for laws that aid victims of sexual abuse. "Based on everything that’s happened, not just in New Jersey but around the country and the world, you have to follow the spirit of the law, and they have not done that in this case. Zero tolerance is zero tolerance."